Generally, guests do prior research on their own. A sense of confusions prevails with different data projection from various sites and subjective ideas in the forum and blogs. Some online travel sites have gone to the length of projecting travelling during lean season to the extremes of grimness. Believe us!!! It’s not at all as black as it’s painted. The grimness or lean season consist of July and August due to monsoon and the onset of winter during December and January. But the grimness has its own charms and perks. For instance, when monsoon is in song, it bring joyous rain that carpet the valleys and slopes with greenness, it injects a new lease of life to vegetation to flourish untamed and blessing for intensive terraced rice cultivation. It’s a visual treat to see farmers in motion, be it art of sowing, ploughing, or the children playing in the rice field.The monsoon, on synoptic scale, precipitation decreases largely from south to north. In the Southern foothill, mainly Phuentsholing, Gelegphu etc., annual precipitation is more than 400 cm. On the contrary, valleys like Thimphu, Paro, Bumthang and Punakha valley it is less than 90 cm. The warmth that the winter brings forth is the amazing clarity in visibility. The white carpet of snow that adorn the higher passes like Dochula with 108 Chortens being tenderly covered with white blanket of snow, and crystal clear view of majestic snowcapped Himalayas ranges. To savour the delight for the birds lover, the famed migratory highly endangered black neck cranes garnish the Phobjika valley’s plate during winter. Migrating all the way from Tibetan plateau to warmer Phobjika valley. Overall, these lean seasons add a new dimension to the landscape of the country.The perks associated are simply endless. 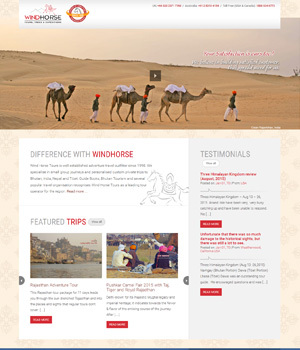 Lesser travellers during these seasons spell readily availability of best services in term of hotels, guides, chauffeurs and undivided attentions to the details. And most importantly, it’s less taxing to your wallet, with the air fare at its lowest best and the land cost ideally low. Contrary to pre-conceived notion of weary monsoon and dreadful winter, we have seen many guests happy coming out happier during this lean season. So in view of those, we would say the favourite time is Winter months from December till mid March. Even though there are snows in the higher regions, the southern regions and main valleys where visitors generally travel are considerably warmer. Paro and Thimphu normally experience only light dustings of snow. 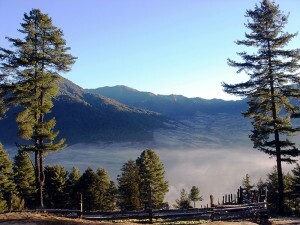 The days are pleasant with clearest skies than at any other time of the year, affording grand Himalayan vistas. It is only at night when the temperatures may fall below freezing, but by then you are comfortable in warm heated rooms. Beside the best in offering, Festivals are integral part of culture and tradition and so much interwoven with social fabric that it defines the daily lives of Bhutanese. Sometime it look like celebration of colours, with spectrum of colours on display in form of people deck up in their finest attire , with mammoth colour rich Thangkha on display on last day, dancer in varying colourful masks decorates the festivals. The next good season is from early-mid summer period (May till July) You may experience occasional heavy falls of rain during the afternoons however to see Bhutan so green and full of clear streams and waterfalls is worth it. While you may not experience grand Himalayan vistas at this time, you will enjoy the warmer weather and a noticeable reduction in tourist numbers. It is a beautiful time to visit! While the spring months of March & April and autumn are considered the best time to visit Bhutan in terms of weather as well as multitude of festivals, the true charm of Bhutan is somewhat subdued, as most of the visitors (80% of the total visitors) tend to come at this time. If you wish to experience a travel with best guides, better rooms, occasional opportunity to meet locals and interact with them, visit farm houses etc, and more personalised attention to you, then you should consider our favourite month. Himalayan’s ranges rules the landscape of Bhutan. The geographic co-ordinates of Bhutan is Latitude 27.5 N and Longitude 90.5 E. A tad more than imaginary Tropic of Cancer, which pronounce the tropical climate as an inevitable conclusion. Bhutan lies at par with New Delhi in India, Cairo in Egypt and Miami in USA. 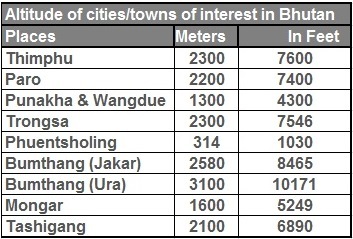 Bhutan being in same latitude with these cities, one may think Bhutan may be hot, conversely, it experiences very pleasant weather throughout the year due to elevation of valley.With the exception of southern regions, and the northern frontier with Tibet, the middle valleys where most people live and tourists visit, enjoy pleasant temperate climate with moderate changes between winter and summer. The weather can vary due to changes in elevation. For instance, Punakha and Wangdue is warmer than Thimphu and Bumthang colder than both, which is due to variation in altitude. 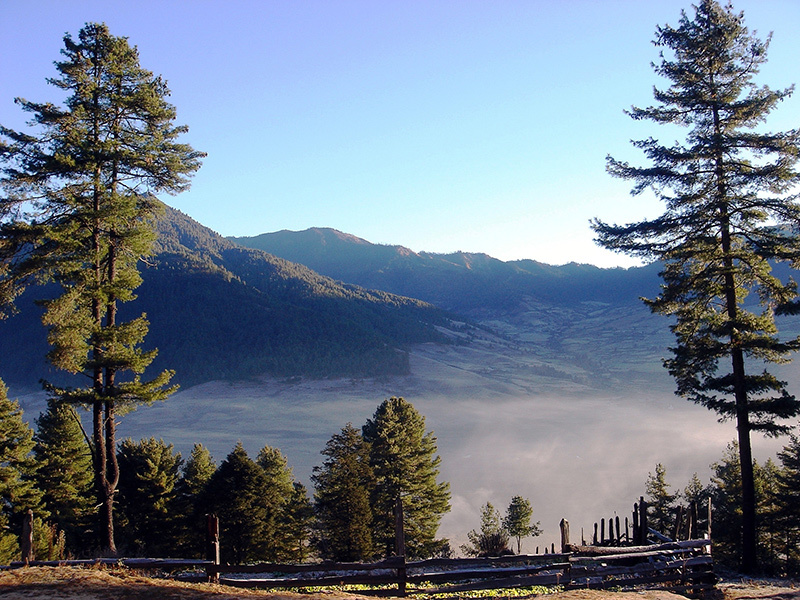 It is difficult to accurately generalise the climate of Bhutan because of the variations in elevations and seasons. 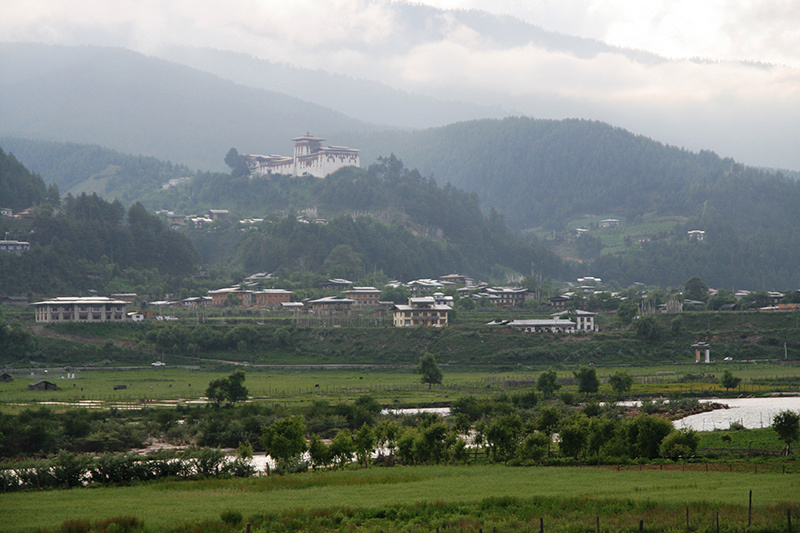 Southern Bhutan has a tropical climate with hot humid monsoons. Spring in the valleys like Thimphu and Paro (mid-March to May) has warm days (68 F) and cool nights and it is noticeably warmer in Punakha and Wangdi, and colder in Bumthang, due to differences in elevations. June marks the beginning of summer when day temperatures warm up to 80 F – 84 F. By July, the rainy season starts and continues till mid-September. The autumn months of September to November are ideal for trekking with clear skies and mild weather. From December till February temperatures fall, but the days are warm and the clear, blue winter skies serve a striking background to the snow-capped peaks. On a sunny day, temperatures reach about 60.8 F – 64.4 F. During the nights, however, are cold with temperatures falling often below freezing. Precipitation decreases progressively from south to north. In the southern foothill, mainly Phuentsholing, Gelephu and Samdrup Jongkhar etc, annual precipitation is more than 400 cm. On the contrary, in the western and central valley regions like Thimphu, Paro, Punakha, Haa and Bumthang, it is less than 90 cm. Along the southern foothill of Bhutan Himalaya, precipitation is found abundant because of the high mountain and thermally induced cumulus convection. In western and central valley regions precipitation decreases largely because of the barrier effects, due to southern high Himalayas, the south east monsoon shed its maximum moisture in southern foothills and become less by the time it reaches western and central regions. Altitude has direct bearing in determining the weather in Bhutan. Correspondingly, the clothing or dressing should relate to the average weather conditions. However, it is difficult to recommend one specific set of clothing. The factors that govern the weather are varying elevations of different places and seasons. Generally, the propensity of temperature to fluctuate dramatically in a day and night makes it even more unpredictable. For instance, in Thimphu, in Dec, the day can be warm with approx650 F and it can drop down drastically to 32.8 o F at evening or the journey from Thimphu (2200 m) to Punakha (1200 m), you can feel considerably change in temperature, as it get warmer, which is due to differences in altitude. 2.They are always culturally appropriate. 3.They are cooler than pants. 4.It is easier to “squat” in a skirt. 5.You can easily bathe surreptitiously under a skirt, if necessary.